1 of 5 In a large pot, bring chicken broth and 1 1/2 cups water to a boil. Add chicken and simmer 3 minutes. Add carrots, snow peas and ginger; simmer 3 minutes. 2 of 5 Stir in scallions, soy sauce, lime juice and hot sauce. 3 of 5 Meanwhile, boil rice noodles for 6 minutes. Drain. 4 of 5 Divide cooked noodles among four bowls. 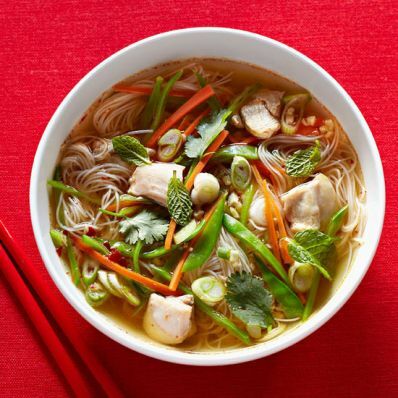 Spoon an equal amount of soup into each bowl of noodles. 5 of 5 Scatter mint and cilantro over each dish and serve immediately.